Chinook Peak is an 8-point, 6,904′ summit located very near Chinook Pass on Washington state highway 410 and is about 3 miles south of Crystal Mountain. The peak is not overly difficult to summit, but requires good navigation skills or a reliable GPS, as there are no established trails for part of the route. 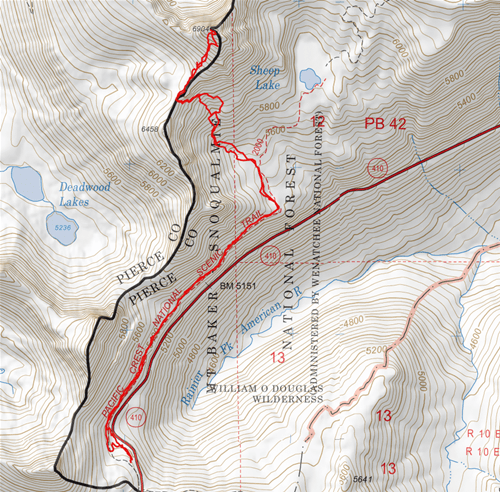 The trip to the summit is only about 2.5 miles with 1,900′ of elevation gain, but most of that gain is compressed into a one mile stretch of steep cross-country ascent. The summit offers splendid 360 degree views, including a broad view of Mt. Rainier to the west. The rocky summit has enough room for comfortable radio operations, but provides little in the way of wire antenna supports. This summit caught my attention because it didn’t look overly difficult, and had never been activated. My hiking buddy Dave and I decided to give it a try on August 16, which was a Sunday with a great weather forecast. Online hiker reports suggested that the most direct route was from the Chinook Pass Pacific Crest Trail (PCT) trail head. On Saturday night I posted an alert for a 1:30 pm PDT activation time, and mailed out some private notices, including one to Tim, KG7EJT. The next morning Tim responded that he would do Crystal Mountain with a 1:00 pm activation time. Now we had an S2S party! We arrived at the Chinook Pass trail head parking lot (a short distance past the pedestrian bridge) in mid-morning, only to find it completely full. We parked along the highway and loaded up with sunscreen and water. The trail is picked up from the parking lot on the west side of the highway. When I hit the ridge line, there was another large bowl with an even steeper incline. There was no sign of a real trail, but plenty of game trails. The matrix was clumpy dirt that, ether from erosion or game, almost formed irregular steps. At some point, I realized that my phone (and GPS) stopped working. It couldn’t lock on any satellites and time was showing as 3:45 pm (the correct time was closer to 1:00 pm). Ugggh. I had route waypoints marked on an OSMAnd app as well as a paper map showing another hiker’s route, but I needed to know where I was to use either one. I pushed on knowing that I could always wait for David to show up with his GPS. I turned on a handheld radio to listen for Tim. Almost immediately, I heard a CQ. But it wasn’t Tim. It was Mark, K7MAS, who was activating Tahtlum Pk (W7W/MC-023), just a few miles south of me on the other side of highway 410. He didn’t know, so I updated him on Tim’s and my plans, including my estimate of one hour to activation. Pushing ahead, I found a well-used game trail with some boot prints. The trail was level and roughly parallel to the ridge line. I could go left, leading away from the summit, or right, heading toward the summit. I had a feeling that I needed to go left, but going right would resolve the question more quickly. David popped up over that first ridge line, and I yelled back to him about the path. I went off on a dead-end adventure to the right. I met up with David back on the path. His GPS (same model as mine) was working fine, so his path (shown on the map) was pretty direct. He describes the route this way: At the top of the bolder field (46.8916246, -121.5099263), work your way to a large outcrop in the middle of the bowl. Find the game trail just above that outcrop (46.8937637, -121.5108892), turn left and follow the trail to the next ridge (46.8934924, -121.5129921). On that ridge, we turned right, and in front of us was a large, steep pasture with an awesome Chinook Peak summit sitting at the top. The rest was conceptually pretty simple…walk toward the summit. The view is intimidating, however, as the peak looks like a technical climb from this point, but near the base of the summit, one heads right to the ridge edge to find an easy walk-up. No scrambling required. About half way up the ridge, I heard Tim calling CQ. He had made it to Crystal Mountain. I gave him an update and a new ETA, which he kindly passed on to other stations, some who were probably looking for me. I arrived about 80 minutes behind schedule just as Mark and Tim made contact. Mark was on his way back from a swim in Dewey Lake. I worked them both (again), this time from the summit. Largely thanks to Tim, I worked a bunch of (mostly familiar) folks on 2m FM (W7GLF, KD7TS, KG7P, AA7W) before switching to 2m SSB (WA7GCS, K7ND). With Mt. Rainier in my face, I attempted 1296 MHz QSOs with Tom, KE7SW, Ray, W7GLF, and Jim, K7ND, and was able to work Ray and Jim. Tom and I also tried a 900 MHz QSO, but I discovered that the connection on the PC board antenna was damaged. Finally, I set up a longwire antenna for 20m and worked W7RV and N7UN before calling it an activation. The trip back down was fairly straightforward, but the steep terrain kept our speed in check. This is a perfect summit for cross-country adventurers.